In his briefing to the UN Security Council, the UN Special Coordinator for the Middle East Peace Process Nickolay Mladenov said that he “remain[s] very concerned by Israel’s persistent use of live fire against protestors” in the Gaza Strip. Israel continues to “inexplicably” impose a ban on the exit of processed foods from the occupied Gaza Strip to markets in the West Bank and Israel, reports Israeli human rights NGO Gisha, “thwarting economic activity and growth in one of Gaza’s most promising sectors”. Processed food, defined as “any kind of food that has undergone an adaptation and manufacturing process, including things like date paste, cookies, and potato chips”, had been a significant part of the Gaza economy prior to the blockade. Now, however, “Israel’s policy regarding movement of goods out of Gaza reveals that dates can go to the West Bank but not date paste, and tomatoes can be shipped to Israel but not tomato paste,” Gisha described. Gisha noted how “Israel’s comprehensive ban on the sale of goods in Israel and the West Bank was enforced until late 2014 and was one of the major causes of Gaza’s economic stagnation.” Yet while some of these restrictions have eased, the ban on “the marketing of processed foods” remains. Before the blockade was tightened in June 2007, a monthly average of 1,064 trucks carrying goods exited Gaza for the West Bank, Israel and abroad. In 2008, a total of only 33 truckloads of goods left Gaza all year. “While many in Israel talk about the importance of enabling economic development Gaza, including for Israel’s own security interests, in practice, Israel imposes arbitrary and sweeping restrictions on movement that thwart economic growth in the Strip without any clear reason,” the NGO concluded. Israeli Prime Minister Benjamin Netanyahu said on Monday that the Palestinian village of Khan al-Ahmar, in the occupied West Bank, “will be demolished very soon.” Netanyahu made the remark during a press conference. The demolition of the Palestinian Bedouin village located in the occupied West Bank has been delayed several times. No new date for its destruction has been released. The residents of the village belong to Al-Jahalin tribe, which was evacuated forcibly to the West Bank by the nascent state of Israel in the early 1950s as part of its ethnic cleansing of historical Palestine. The West Bank was under Jordanian control at the time. Former Defence Minister Avigdor Lieberman as well as Education Minister Naftali Bennet have criticised Netanyahu several times for not demolishing the village. According to Defence for Children International Palestine (DCIP), since the beginning of the year, the Israeli Occupation Forces have killed 52 children in the West Bank and Gaza Strip, 46 of whom in the Gaza Strip. The international movement said in a statement on Monday that among the children the occupation forces have killed, 18 were injured in the head, nine in the chest, seven in the abdomen, and five in the neck. It stressed that the Israeli Occupation Forces are still using excessive force and live bullets against Palestinian children by intentionally targeting them. The international movement considered that the reason for the use of excessive force was the widespread culture of impunity among the Israeli occupation soldiers and their prior knowledge that they would not be held accountable for their actions whatever the results. DCIP also pointed out that, according to the Israeli Occupation Forces regulations, live ammunition must be only used in circumstances that pose a direct mortal threat to the soldier, and indicated that there is so far no evidence that suggests that children who have been shot dead since the beginning of 2018 posed such a threat at the time when they were shot. It is worth noting that Tuesday, 20 November, is the Universal Children’s Day, when the Declaration on the Rights of the Child was adopted by the United Nations General Assembly on 20 November 1959. On the same day in 1989, the General Assembly adopted the Convention on the Rights of the Child. Since 1990, the Universal Children’s Day marks the commemoration of the adoption of the United Nations General Assembly of the Declaration and the Convention on the Rights of the Child. Since 2000, the Israeli Occupation Forces, security guards and settlers have killed more than 2,070 Palestinian children, according to DCI documentations. Israel is still the only country in the world to systematically prosecute between 500 and 700 Palestinian children before military courts each year, in a way that lacks basic rights to a fair trial. Atalla Fayoumi hobbles on crutches across the flat, sunbaked plain near Gaza border fence, gazing toward plumes of smoke rising from a clutch of burning tires in the distance. The 18-year-old Palestinian’s right leg was amputated after Israeli soldiers shot him in April at one of the mass demonstrations held weekly for the past eight months against Israel’s long blockade of Gaza. Yet, like other desperate young men in Gaza who feel they have nothing left to lose, he has kept returning to the protests. The 11-year blockade, imposed by Israel, is aimed at weakening Hamas, the militant group that seized power in Gaza from the internationally-backed Palestinian Authority in 2007. But its impact is felt by all. Raw sewage flows directly onto once-scenic Mediterranean beaches, tap water is undrinkable, and electricity is available just a few hours a day. Over half the Gaza Strip’s 2 million people are unemployed, and most residents cannot leave. While most Gazans see the protests as the inevitable reaction to Israel’s siege, Israel views them as coordinated attacks and says it must defend itself. By 5 p.m., at least 13,000 people are gathered along the border, throwing rocks and burning tires. Ambulance sirens begin to howl soon after, signaling the start of the day’s violence. At a medical triage tent about a kilometer from the frontier, they bring the wounded: a 22-year-old shot in the left leg, an 18-year-old struck by shrapnel, a 31-year-old shot in the chest. A few dozen meters away, five men in checkered, black and white headscarves are performing a traditional folk dance with their arms crossed for a captivated crowd under a massive tent. Behind them, in the distance, the border fence looks like a war zone; the sky is completely black, burning tires are shooting flames into the air, and gunfire is ringing out every few minutes. On Sunday, Fayoumi is sitting on the small bed in his small room, showing off pictures of himself at Friday’s protest. 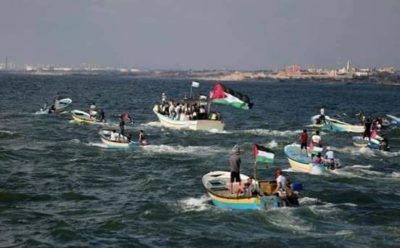 Israeli navy ships opened fire, on Tuesday morning, at several Palestinian fishing boats, while the soldiers invaded agricultural lands, in the Gaza Strip. Media sources in Gaza said several armored military vehicles, stationed at Abu Safiya army base, across the perimeter fence, invaded farmlands, east of the al-Maghazi refugee camp, in central Gaza. They added that the army vehicles, including bulldozers, advanced nearly 100 meters into the lands, and bulldozed sections close to the fence. 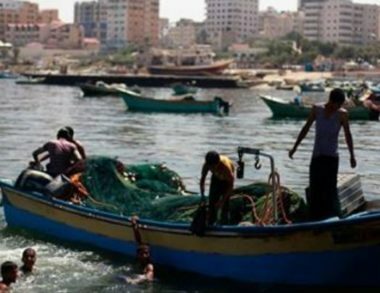 In addition, the Israeli navy ships fired many live rounds at fishing boats, in Palestinian territorial waters close to the shore, in the northern part of the coastal region. 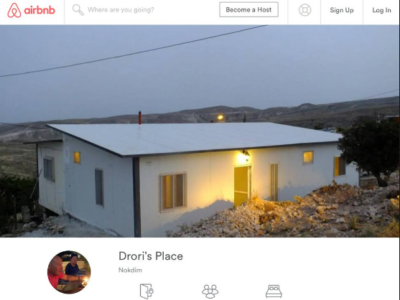 On Monday, the international crowdsourced bed and breakfast company AirBnB announced that they will no longer allow listings that are located in Israeli settlements on occupied Palestinian land. The decision comes after a two year campaign of Human Rights Watch and other organizations, who pointed out that the promotion of listings in the Israeli-occupied West Bank is a violation of the Fourth Geneva Convention and of international law. Israeli military forces began occupying the Palestinian Territories of Jerusalem, the West Bank, Gaza and the Syrian territory known as the Golan Heights in 1967. Such military occupations are meant to be temporary situations, according to the Fourth Geneva Convention, and are not meant to last for decades, like the Israeli occupation of Palestine has. In addition, it is expressly forbidden, under the Fourth Geneva Convention, to transfer civilians into land occupied by military force. Over the past 51 years, Israel has, in direct violation of the Fourth Geneva Convention, transferred more than 500,000 civilians into housing developments on stolen Palestinian land – most of which was initially seized by the military for ‘security purposes’, then transferred to civilians for colonial settlement takeovers. In response to the announcement by AirBnB, the Israeli Tourism Minister Yariv Levin said that the Israeli government will restrict AirBnB’s operations in Israel as a whole. Levin claimed without evidence that AirBnB was ‘singling out’ Israel, and that the decision was based in ‘anti-Semitism’. The Israeli Minister of Strategic Affairs Gilad Erdan said that he would be contacting U.S. officials to try to charge the company in U.S. courts for an alleged violation of the Israeli anti-boycott laws recently passed in 25 US states following lobbying by Israeli-government funded lobbying groups. AirBnB, in their statement, made clear that Israel is not being singled out, and that this decision is based on its newly released international standards on not allowing listings on lands where people have been displaced. Media sources said 63 Knesset members approved the plan, while 41 others voted against it. The constructions are in Silwan Palestinian town, which is subject to ongoing illegal annexation of its lands, homes and property, in addition to frequent demolition of homes. The “City Of David” colonialist project is part of the larger plan which include the Old City of Jerusalem, and various Palestinian areas near its walls, where more than 100.000 indigenous Palestinians reside. Israel initially claimed that the “City Of David” project would be a national park and facilities, with no residential components, but is now approving housing units of the illegal colonialist settlers. It is worth mentioning that Elad colonialist organization, which instigated this bill, has been pushing for the construction and expansion of colonies in occupied Jerusalem, especially in the heart of Palestinian neighborhoods and towns. This is happening while the Palestinians are denied the basic rights to build and expand their homes on their own lands in occupied Jerusalem, and amidst ongoing demolition of their homes and property. 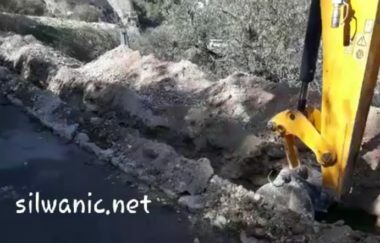 On Tuesday, Israeli bulldozers dug and uprooted lands in Wadi ar-Rababa neighborhood in Silwan, and started preparing for terraced trenches, as part of the ongoing illegal colonialist activities.